Specializing exclusively in hydraulic dynamometers and associated equipment, Kahn Industries pioneered the design concept of the portable, flange-mounted dynamometer over thirty years ago. Since then, significant advances have been continuously incorporated, particularly in the areas of higher operating speeds, easier-to-use designs, improved materials, and increasingly sophisticated computer-interfaced, closed-loop dynamometer controls. The result has been a widely acknowledged leadership in product performance and reliability. With designs capable of absorbing up to 75,000 kW (100,000 hp) and operating at speeds up to 100,000 rpm, Kahn hydraulic dynamometers are now at work in engine test facilities around the globe. With a product line of over 50 standard dynamometer models and a large number of special purpose designs, Kahn Industries is the only American-owned manufacturer producing a complete offering of dynamometers to measure and absorb the power output of virtually any prime mover. All Kahn dynamometers are inherently bi-directional and therefore do not require repositioning to switch the direction of rotation. 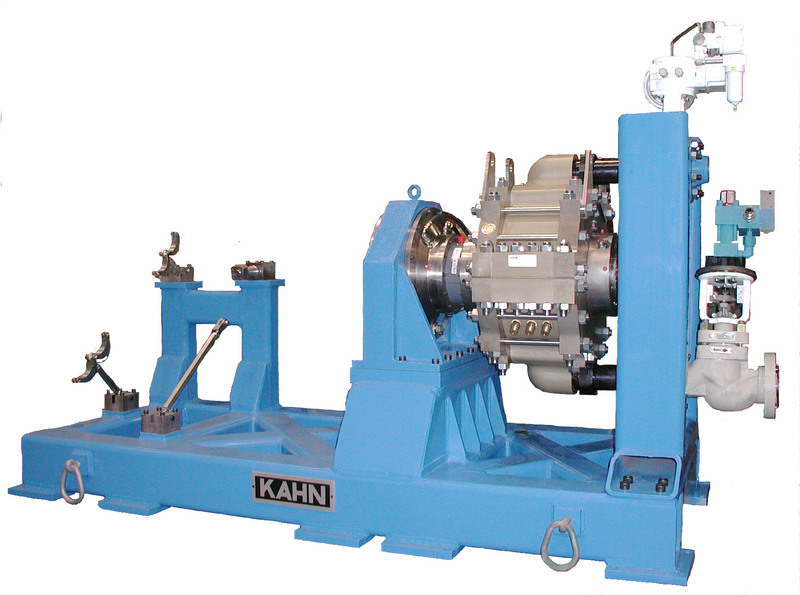 Inherent low inertia and quick transient response make the Kahn Series 101 and 102 dynamometers ideal for load testing of medium speed turboshaft engines, light turboprop engines, auxiliary power units (APUs), engine power takeoffs (PTOs), aircraft accessory gearboxes and helicopter transmissions. In many of these applications, time-consuming coupling shaft alignment is eliminated by mounting the dynamometer via adapters directly to the engine power output pad. 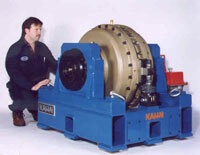 For high-speed turboshaft engines and experimental turbines, we offer the Kahn Series 404 dynamometers. Equipped with smooth disc power elements that absorb power by viscous shear rather than through highly turbulent vortex formation, the Series 404 are the only high-speed hydraulic dynamometers in their power class which carry a 5000 hour/60 month warranty against cavitation damage. Operating experience in the field has shown that the actual life of the power elements is well in excess of 10,000 operating hours. 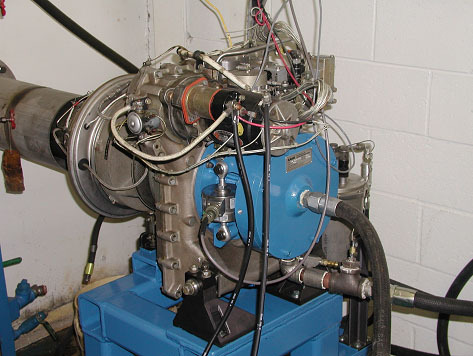 In addition to dynamometers, we offer engine test stands and inertia flywheels for turboshaft and turboprop engines; also available are mounting adapter kits for auxiliary power units, power takeoffs and accessory gearboxes. Model 101-080 Hydraulic Dynamometer. Mounted directly on T62T Series auxiliary power unit (APU). Model 404-025 Hydraulic Dynamometer. Cavitation-free high-speed dynamometer rated at 1860 kW (2500 hp), 30,000 rpm. 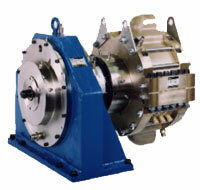 Mounted to a flywheel, this unit is used for load testing helicopter turboshaft engines. Based on the success of our portable, flange-mounted dynamometers for aerospace applications, we developed the Kahn Series 301 hydraulic dynamometers for load testing of automotive diesel and gasoline engines. Their lightweight, flange-mounted configuration permits quick no-alignment-needed installation directly onto the engine flywheel housing. Tough, highly cavitation- and corrosion-resistant nickel-aluminum-bronze power elements assure long service life. The modular construction of the Series 301 permits replacement of the carbon face seal in less than one hour. Mounting adapter kits for popular engines, stationary and mobile engine test stands, engine cooling columns and other engine test accessories are also available. The introduction of the Kahn Series 400 cavitation-free design was a giant step forward in high-speed, high-power hydraulic dynamometers. Intended primarily for long term endurance and production testing of industrial and marine gas turbines, these dynamometers offer many significant advantages, including virtually unlimited service life due to cavitation-free smooth disc power elements. In addition, the Kahn Series 100 hydraulic dynamometers offer a cost-effective alternative for development and production testing. Design features include cavitation- and corrosion-resistant stainless steel power elements and a self-centering polygon connection between shaft and rotor discs that permits quick, on-site overhaul by eliminating hydraulic and heat shrink fits. Model 406-160 Hydraulic Dynamometer. 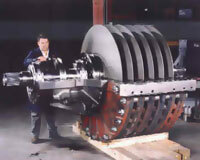 Cavitation-free smooth disc hydraulic dynamometer rated at 60,000 kW (80,000 hp) during assembly. This unit is used for load testing industrial and marine gas turbines. Developed from our successful Series 301 automotive dynamometers, the Kahn Series 302 hydraulic dynamometers cover a wide range of low-speed, high-torque test applications, including industrial, locomotive and marine diesel engines, large electric motors and heavy turboprop engines. Their rugged construction, coupled with their tough, highly cavitation- and corrosion-resistant nickel-aluminum-bronze power elements, assures long service life with minimum maintenance. Series 302 Hydraulic Dynamometer. Low-speed, high torque hydraulic dynamometer rated at 3300 kW (4400 hp). This unit is used for load testing marine diesels.